For almost as long as I can remember, I’ve been fascinated by America’s history. So, it came as quite a pleasant surprise to me one day during my youth to discover it’s possible to collect real, authentic bits and pieces of that history, as opposed to the synthetic keepsakes and phony souvenirs that clog the market place. I gravitated toward collecting paper ephemera—signatures and documents mostly—especially those that are associated with historical figures or that tell an interesting story. During my earliest collecting days I unearthed documents and paper items at stamp and coin shops. As you’d expect, there’s some overlap between the two hobbies. Document collectors want the letter inside the envelope, and philatelists covet the stamp on the cover. One of the first items at such a shop that caught my collector’s eye, just to give you an example, was an illustrated 12” x 18” map of the Pony Express Route of 1860-61, drawn by Captain William H. Jackson and printed for Pony Express Day at the 1940 New York World’s Fair. In addition to a host of items of philatelic interest on the map is a signature of 91-year-old “Broncho” Charlie Miller, the last living Pony Express rider. Later, I discovered through a bit of research that Charlie was signing these maps from 2 to 5 p.m. on July 28, 1940 at the British Pavilion. For a few dollars I purchased a genuine, unique sliver of historical Americana—and one that came with a fascinating story. A quick web search of old Charlie Miller puts one right in touch with that story. But let’s turn now to baseball. At about the same time in my collecting career, I was browsing through a stamp and coin store in suburban Baltimore. In a clump of envelopes, I came across the one pictured here. The owner of the shop was a philatelist, certainly not a rabid baseball fan, and he sold it to me for a couple of bucks as a first day cover—an envelope bearing a stamp and a cancellation from the locale where the stamp was first placed on sale. Fortunately, I saw the stamps and cancellation as well as the accompanying signatures and put two and two together. What that adds up to is an all-American story that takes us to the opening day of the Hall of Fame and, specifically, to one of baseball’s greatest legends. On June 12, 1939—just over 70 years ago—baseball’s Hall of Fame and Museum officially opened its doors. It was a grand day in little Cooperstown, New York, the rustic upstate village nestled against Otsego Lake. Fifteen thousand visitors were on hand for a full schedule of activities. There were formal induction ceremonies for 26 members, heart-tugging speeches, and an exhibition game featuring many of the day’s top players. The photo of the envelope accompanying this brief article tells us something about that historic occasion. To yield up the cover’s story, I did a quick scan of it. 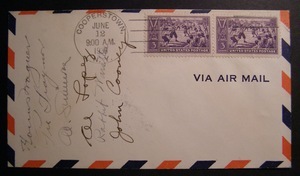 My eye grasped that the envelope consists of three elements: on the left is a column of six signatures, left of center is a postmark, and on the right are two copies of a United States stamp that commemorate baseball’s 100th anniversary. The top signature belongs to the Pittsburgh Pirate’s great shortstop, Honus Wagner—too bad it’s not his autographed baseball card. Wagner, who was active from 1897-1917, was probably the most gifted ball player in the National League during the first two decades of the 20th century. In 1936 the Baseball Writers Association of America held its first election to choose the first class of Hall of Fame inductees, and Wagner was one of the five they selected. Ty Cobb, Walter Johnson, Christy Mathewson and Babe Ruth were the others in the Hall of Fame’s first class. Besides being one of the day’s most honored inductees, Wagner was chosen to be the manager of one of the teams cobbled together to take part in the day’s exhibition game. Eddie Collins, former second baseman with the Philadelphia A’s and White Sox and a HOF class of ‘39 inductee, managed the other squad. “The Wagners” edged “The Collinses” 4-2 in seven innings. I was interested in details about the exhibition game, so I telephoned the research office at the Hall of Fame. The research staff person I talked to was only too happy to help. He told me he could easily supply the information. Sure enough, about three days later a photocopy arrived of several pages from the 1940 book, “A Century of Baseball,” containing facts about the exhibition game as well as a box score. That box score indicates Wagner’s squad included such future Hall of Famers as Charlie Gehringer, Lefty Grove, Ducky Medwick and Arky Vaughan. Wagner gave Babe Ruth a chance to pinch hit, but the 44-year-old Bambino could only manage to pop up on a 2-2 count. Just as an aside, not one of the signers of this cover appeared in that game. The signatures of Pie Traynor, Al Simmons and Al Lopez follow underneath Wagner’s. After Wagner, third-baseman Traynor was Pittsburgh’s next infield great. He played from 1920-1937; his active career never overlapped with Wagner’s. Traynor was inducted into the Hall in 1948. Al Simmons, HOF ‘53, was one of the game’s greatest hitters, twice leading the American League in batting. His best average was .392 in 1927, but that was only second best to Harry Heilmann’s robust .398. In 1939 Simmons’s best days as a player were behind him, and he was the fourth outfielder with the Boston Bees. Amazingly, Old “Bucketfoot” Al would hang on for another four seasons before removing his spikes. Al Lopez was a National League fixture behind the plate, playing for Brooklyn, Boston, and Pittsburgh. For a long time he held the record for most games caught. He also had much success as a manager. His 1954 Indians and 1959 White Sox teams captured American League pennants. His catching and managerial records earned him Hall of Fame induction in 1977. Lopez, affectionately known as El Señor, lived to the ripe age of 97. The bottom signatures belong to “Rabbit” Warstler and John Cooney, who along with Simmons and Lopez were members of the 1939 Boston Bees team. Harold Warstler was a weak-hitting, (mostly) utility infielder whose eleven years in the big leagues were evenly split between the AL (Athletics, Red Sox) and NL (Bees, Cubs). Johnny Cooney had an interesting career. He broke in as a pitcher with the 1921 Boston Braves and spent about eight years on the Braves’ pitching staff. The second half of his active career was as an outfielder-first baseman mostly with the Dodgers and Braves/Bees. Cooney was a long-time coach for both the Braves and White Sox. The postmark displays the date of June 12, 1939, the day of the dedication of the Hall, although it had been open to visitors for a while before its “Grand Opening.” The induction ceremony took place at 12:15 p.m. After the inductions of 26 former players and luminaries of the game, the Hall and Museum were officially opened. The exhibition game followed the ceremony. The baseball commemorative stamp features a nostalgic illustration of a sandlot game symbolic of baseball’s first century. The stamp’s first day and place of issue coincided with the dedication of the Hall of Fame. As the baseball centennial stamp, it supports the controversial claim, most would say myth, that Abner Doubleday, a former resident of Cooperstown and Civil War general, was the game’s originator—or even the initiator of some of the modern features of the game such as bases and diamond configuration. Historian Harry Katz in the summer 2009 issue of American Heritage magazine presents some evidence that helps put the Doubleday claim to rest. Katz’s article includes a photo of a 1744 woodcut of three lads engaged in playing “Base-Ball” from an English children’s book, “A Pretty Little Pocket Book.” The woodcut and its accompanying two-stanza ditty are the earliest known historical references to the game: BASE-BALL.